How can democratic societies push against foreign meddling in domestic elections? In his new study The Case for Civil Resistance to Russia’s Populace-Centric Warfare, Maciej Bartkowski argues that an effective response to this type of challenge should be sought among socially-derived solutions; namely, in the form of a society mobilized and organized around civil resistance strategies and practice. 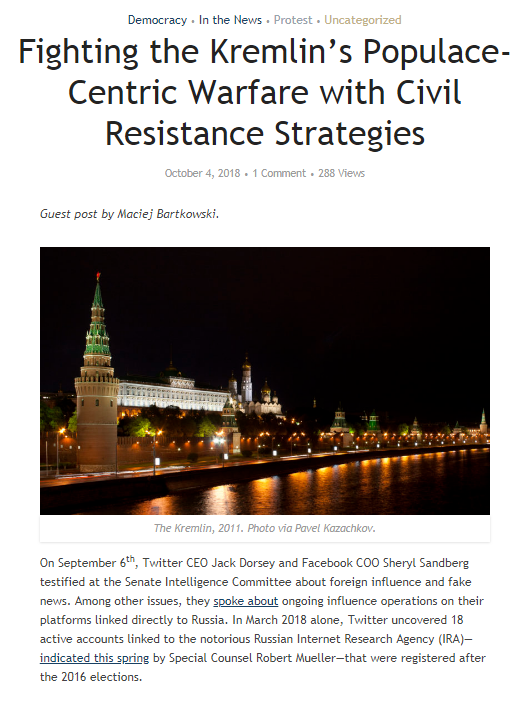 More precisely, civil resistance offers a set of defensive and offensive civilian-based capabilities that democratic societies could deploy to effectively counter Russian meddling in democratic processes.